This blog describes on Configuring and running the Kafka from IBM BigInsights. I assume that you were aware of terminologies like Producer, Subscriber, Kafka Brokers, Topic and Partitions. Here, I will be focusing on creating multiple Brokers in BigInsights then create a topic and publish the messages from command line and consumer getting it from the Broker. 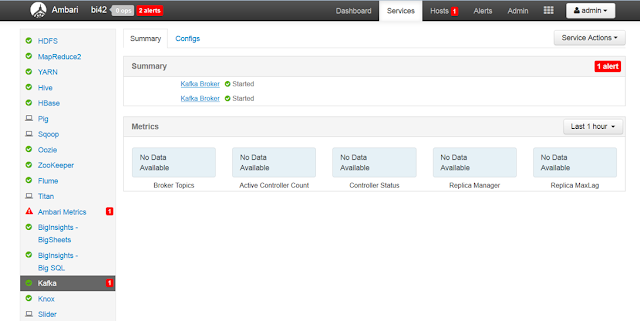 By default, Ambari will have one Kafka Broker configured. Based on your usecase, you may need to create multiple brokers. 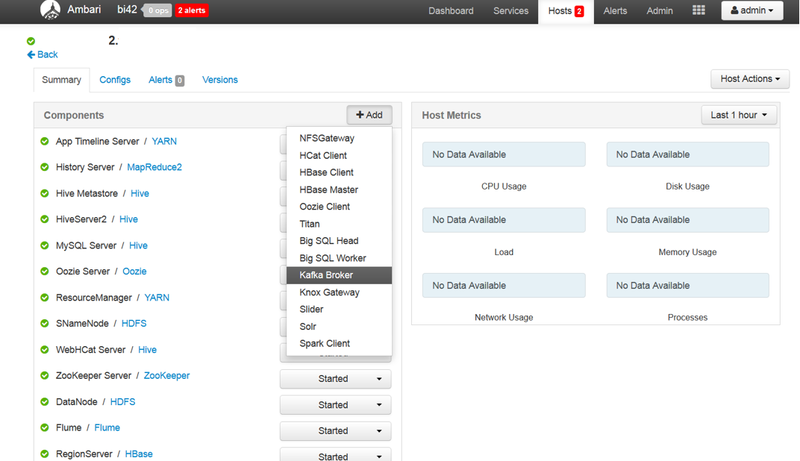 Login to Ambari UI --> Click on Host and add the Kafka Broker to the node where you need to install Broker. You can see multiple brokers running in Kafka UI. Login to one of the node where broker is running. Then create a topic. su kafka -c "./kafka-topics.sh --create --zookeeper localhost:2181 --replication-factor 2 -partitions 1 --topic CustomerOrder"
You can get the details of the topic using the below describe command. su kafka -c "./kafka-topics.sh --describe --zookeeper localhost:2181 --topic CustomerOrder"
In the argument --broker-list, pass all the brokers that are running. su kafka -c "./kafka-console-producer.sh --broker-list bi1.test.com:6667,bi2.test.com:6667 --topic CustomerOrder"
Open an other Linux terminal and start the consumer. It will display all the messages send to producer. su kafka -c "./kafka-console-consumer.sh --zookeeper localhost:2181 --from-beginning --topic CustomerOrder"
Thus, We are able to configure and perfom a sample pub-sub system using Kafka. Thank you for sharing your valuable article this is the best blog for the students. learn Workday HCM Online Training. Thanking to provide best article blog having good information useful for everyone.you can also learn Big Data Hadoop Online Training.